Saleor offers a few ways to set-up your email settings over SMTP servers and relays through the below environment variables. You can set the environment variable EMAIL_URL to the SMTP URL, which will contain a straightforward value as shown in below examples. If you want to use your personal GMail account to send mails, you need to enable access to unknown applications in your Google Account. Always make sure you set-up correctly at least your SPF records, and while on it, your DKIM records as well. Otherwise your production mails will be denied by most mail servers or intercepted by spam filters. You can customize the sender email address by setting the environment variable DEFAULT_FROM_EMAIL to your desired email address. You also can customize the sender name by doing as follow Example Is Me <your.name@example.com>. After you created your sendgrid application, you need to set the environment variable EMAIL_URL as below, but by replacing YOUR_API_KEY_HERE with your API key. Then, set the environment variable DEFAULT_FROM_EMAIL as mentioned before. As it is not in the setup process of sendgrid, if your ‘from email’ address is your domain, you need to make sure you at least correctly set your SPF DNS record and, optionally, set your DKIM DNS record as well. After you added your domain in Mailgun and correctly set-up your domain DNS records, you can set the environment variable EMAIL_URL as below, but by replacing everything capitalized, with your data. Let’s say my domain name is smtp.example.com and I want to send emails as john.doe@smtp.example.com and my password is my-mailgun-password. After adding your domain in Mailjet, you have to set the environment variable EMAIL_URL as below, but by replacing everything capitalized, with your data, available at this URL. 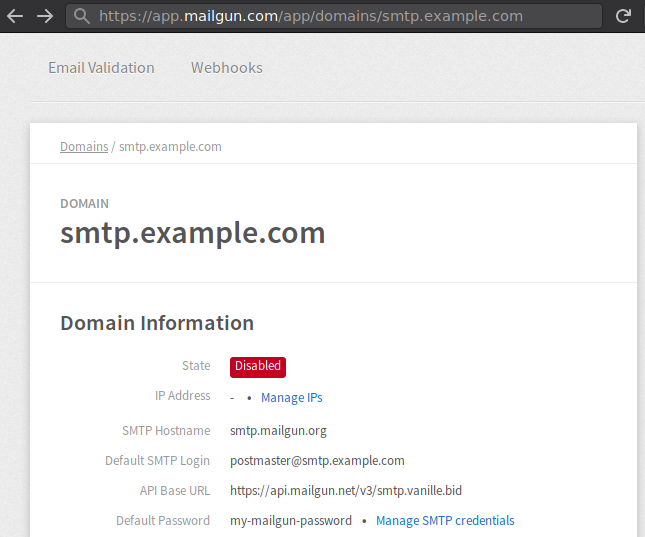 After having verified your domain(s) in AWS SES, and set-up DKIM and SPF records, you need to create your SMTP credentials. Then, you can use this data to set-up the environment variable EMAIL_URL as below, by replacing everything capitalized, with your data.